KATHMANDU, July 17: Over Rs 23 billion was spent through various INGOs in the 22 tarai districts of the country during fiscal year 2016/017, it is learnt. A total of 74 INGOs had channelled Rs 23.85 billion through 745 projects in the tarai, which includes the country’s southern plans from Jhapa district in the east to Kanchanpur in the west. According to the International Economic Cooperation Coordination Division under the Ministry of Finance, most of the budget was spent on awareness generation, religion conversion, health and education. Political analyst Tula Narayan Shah, who has been closely observing Madesh issues, said “Although we cannot generalize that the INGOs are involved in wrongdoing, their continuous monitoring is a must.” He was quick to praise some of the work and contributions of the INGOs, including in the empowerment of women, Dalits and other groups. “However, there are also those who indulged in financial irregularities. Their work involves constructing small waterways while they swallow up the budget of irrigation canals,” Shah added, stressing the need to tightly monitor INGO activities. There are 26 USA-based INGOs present in the districts of the tarai, followed by 14 INGOs based in the UK, four each from Germany and Switzerland and one belonging to Saudi Arabia. In just eight districts of the region - Chitwan, Sunsari, Mahottari, Sarlahi, Makawanpur, Rupandehi, Banke and Kailali - the INGOs have spent around Rs 1 billion each. Six of these districts have seen expenditures crossing a billion. The maximum expenditure is in Rupandehi, amounting to Rs 1.91 billion, while the least among these districts is in Bardia, where the total expenditure is Rs 540 million. 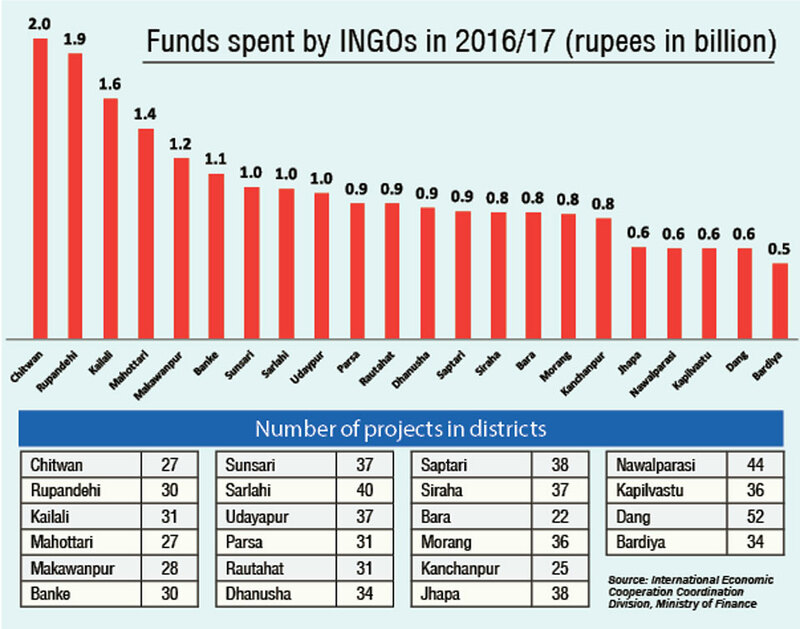 In Sunsari, the INGOs spent Rs 1.13 billion through 31 projects, while they spent Rs 1.36 billion in Mahottari through 40 projects. Likewise, INGOs’ expenditure in Makawanpur amounts to Rs 1.23 billion through 38 projects, Rs 1.06 billion in Banke through 44 projects, and Rs 1.64 billion through 52 projects in Kailali. Of the districts of Province 1, the expenditure in Jhapa was Rs 612 million, Rs 829 million in Morang and Rs 975 million in Udayapur. Likewise in Province 2, the expenditure was Rs 848 million in Saptari, Rs 844 million in Siraha, Rs 865.5 million in Dhanusha, Rs 998 million in Sarlahi, Rs 995 million in Rautahat, Rs 864 million in Bara, and Rs 902.1 million in Parsa. In Province 3, the INGOs spent Rs 1.9 billion in Chitwan through 37 projects. They spent Rs 1.23 billion in Makawanpur. 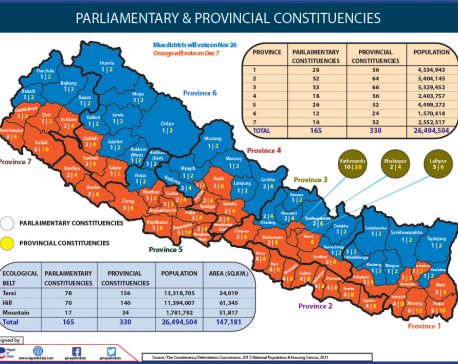 Likewise in the six districts of Province 5, they spent Rs 600 million in Nawalparasi, Rs 1.92 billion in Rupandehi, Rs 652 million in Kapilvastu, Rs 1.06 billion in Banke, and Rs 540 million in Bardia. The INGOs involved include Dan Church Aid of Denmark, Lutheran World Relief of USA, Safer World of UK, Back to Life of Germany, Eye Care Foundation of the Netherlands and Ostomy Foundation of Norway. According to division chief Baikuntha Aryal, the ministry only keeps track of the budgets of the INGOs. “We do not have records of the working areas of the INGOs. The Social Welfare Council keeps records of that,” he said. Dolendra Niraula, joint secretary at the Ministry of Women, Children and Social Welfare, said the activities of INGOs have been under constant monitoring. “District Coordination Committees and District Administration Offices will monitor their activities in coordination with independent experts and auditors.” INGOs ignoring government guidelines will face action, including the scrapping of their registration, he added.